DONETSK, Ukraine -- After weeks of defying international pleas to free eight European officials they had captured in May, pro-Russian rebels in east Ukraine released them unexpectedly in June following a public appeal by the head of the Russian Orthodox Church, Patriarch Kirill. Russia's President Vladimir Putin (L) and Patriarch of Moscow and All Russia Kirill arrive for the meeting with Russian Orthodox church bishops in Moscow. The ROC, which claims jurisdiction in most of the former Soviet world, used its leverage beyond Russia's borders merely to mediate, it said. "The church was asked to take part. Why shouldn't it help?" Metropolitan Merkury, Kirill's contact man for the OSCE release, said. The crisis in east Ukraine, which followed Moscow's annexation of Crimea in March, threw ties between the Kremlin and the West deep into disarray. The West responded with sanctions to what it says is Moscow arming the rebels and reinforcing them with Russian troops. Moscow denies taking part in the armed conflict in spite of growing evidence to the contrary. "Russia does not fully control the rebels but it does exercise influence over them," said a Western diplomat in Moscow closely following the crisis. "The Church is put in between the two to blur that link and avoid having any direct lines between them." A European diplomat in eastern Ukraine said the ROC had acted as Moscow's "front organisation" in the release of the OSCE captives, allowing the Russian state to continue denying it had any direct involvement. The OSCE said it was a mix of interventions that made the release possible. A spokesperson for the Russian Foreign Ministry declined to comment on the OSCE case. The person said the ministry does not favour the ROC over other creeds it works with. The Kremlin was not available for comment. The ROC says it is not the state church of Russia. But it has cooperated closely with the Kremlin under Putin, who helped it make a striking comeback from heavy oppression in the Soviet era. The ROC has built or restored about 25,000 churches in the past quarter-century, most of them in its traditional territory of the former Soviet Union. But it has also reclaimed churches in countries from France and Italy to Cuba and North Korea. Senior officials in the ROC, still dogged by rumours of Soviet-era collaboration with the KGB secret police, are used to being asked whether they are too close to Putin. Under Putin, the ROC gets support from the state and powerful oligarchs allied to the Kremlin, while Moscow benefits from its public blessing. A recent poll showed 75 percent of Russians approve of the ROC and more than half value its close ties with the state. The foundation's board includes Igor Shchyogolev, one of Putin’s aides at the Kremlin. The fund says it offers humanitarian aid for the rebel-held east Ukraine under an agreement signed with Aleksander Borodai, formerly the top separatist leader. In July, Kiev opened an investigation into Malofeev, alleging that he was financing armed rebels in east Ukraine. The European Union sanctioned Malofeev soon afterwards, saying he used to employ Borodai and was destabilising Ukraine. Malofeev did not respond to request for comment on that. Another powerful figure in the Orthodox world is Vladimir Yakunin, head of Russian Railways and a long-standing ally of Putin. Yakunin, sanctioned by Washington over Ukraine, heads the St. Andrew the First-Called Foundation, which helped reunite Kirill's Moscow Patriarchate and the Russian Orthodox Church Outside Russia, which separated from the ROC in the 1920s. At the 2007 Moscow ceremony marking the reunification, Putin called the merger "an event of truly nationwide, historic importance and great moral significance." He added: "The revival of the church unity is a crucial condition for revival of lost unity of the whole 'Russian world', which has always had the Orthodox faith as one of its foundations." When Russia sent its troops to Crimea, one of the justifications it used was an alleged threat to parishes there linked to Kirill's Moscow Patriarchate. Kirill's full title is "Patriarch of Moscow and All Rus," a reference to a medieval state in Kiev to which modern Russia traces its roots. In Ukraine, Kirill oversees the Ukrainian Orthodox Church of the Moscow Patriarchate. It competes against a smaller church of the Kiev Patriarchate that split from Moscow after the collapse of the Soviet Union. Winning applause from those Ukrainians who seek Western integration and scorn Moscow's efforts to undermine it, the Kiev Patriarchate has strongly backed Ukraine's national cause in the current conflict. 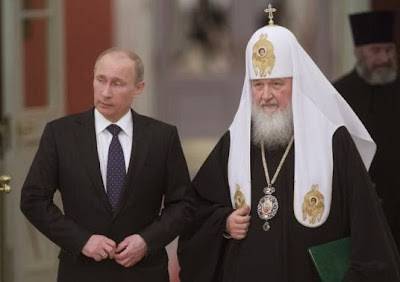 Its head, Patriarch Filaret, blamed Putin squarely for the violence and said he was possessed by Satan. Late last month, Kirill told a meeting with Orthodox media that it was “fundamentally wrong” to view the ROC as a vehicle of Russian state policy. But to many in Ukraine that sounded unconvincing, and controversy over the ROC’s role in the OSCE monitors’ case adds to that skepticism. Vodolatsky, a member of Putin's ruling United Russia parliamentary faction, said he contacted the head of Cossack forces in east Ukraine, Nikolay Kozitsyn. He said ROC's Metropolitan Merkury also talked to Kozitsyn. "He (Merkury) knows every ataman (Cossack leader) among us," Vodolatsky told Reuters. "It was no problem for him to take his phone, call Kozitsyn and solve all the problems with him." "For any Cossack the Orthodox faith is predominant. The Patriarch is our spiritual leader," he said. "After the Patriarch statement everyone stood at attention and did everything that the Patriarch ordered."